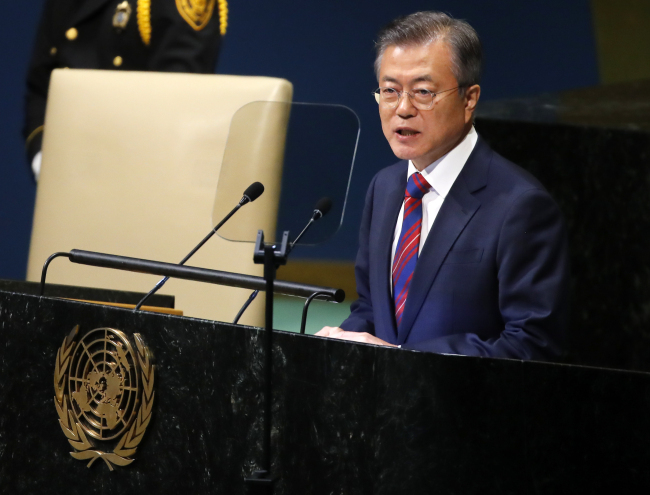 Four major takeaways from Moon’s trip to the US. President Moon Jae-in on Thursday wrapped up his three-day trip to the United States with an aim at reviving momentum for the deadlocked denuclearization talks between the US and North Korea. Including his meeting with US President Donald Trump, Moon’s public engagements were mostly devoted to convincing skeptics in Washington who doubt North Korean leader Kim Jong-un’s willingness to abandon his nuclear program and open up the economy. Having met Kim three times since taking office last year, Moon sought to drive home the message that the current North Korean leader is more serious about denuclearization than any of his predecessors, and that Washington should encourage Kim to move forward by reciprocating his goodwill gesture. With the second US-North Korea summit looming large, what Moon laid out during the New York trip will form the trajectory of future negotiations and security dynamics in the region. Following are four major takeaways from Moon’s trip to the US. Declaring an official end to the Korean War has been a major point of contention between the US and North Korea. Pyongyang demands Washington sign an end-of-war declaration up front, while the US insists North Korea first hand over a detailed inventory of its nuclear program. 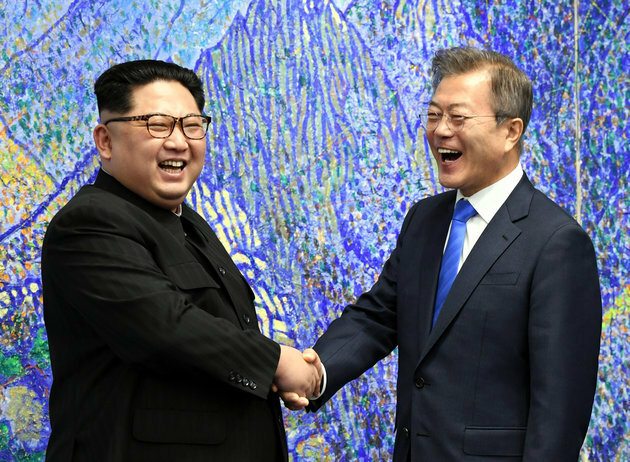 After acknowledging that the issue was brought up during his meeting with Kim and Trump this month, Moon revealed there is consensus among relevant countries for an early declaration, which is to be discussed at the second Trump-Kim summit. For Moon, declaring an end to the Korean War is not a legally binding measure until a formal peace treaty is signed to replace the current armistice agreement. Moon said an end-of-war declaration would only aim to provide a security guarantee for North Korea and encourage Kim to take further steps on denuclearization. However, the prospects for an early declaration remain to be seen amid Washington’s apparent reluctance. While Cheong Wa Dae said there was “in-depth discussion” over the peace declaration between Moon and Trump, the White House made no mention of it. What constitutes a corresponding measure was not revealed and remained shrouded in secrecy — until Moon offered a glimpse into what kinds of measures could meet North Korea’s need. Moon presented a broad list during the interview with Fox News, from the end-of-the-war declaration to sanctions relief, humanitarian aid, exchanges of arts troupes and a business inspection team. Moon also introduced the idea of establishing a US liaison office in Pyongyang. Moon said if North Korea shut down the Yongbyon nuclear reactor, the office could help the US and international inspectors better monitor the dismantling process. “For the US, they promised to end its hostile relations with North Korea to provide security guarantees and also work toward new relations. So, although, all these actions would not happen simultaneously, broadly I believe that these actions need to be taken in parallel,” Moon said. There was one significant message Moon sought to convey in his meetings with a skeptical audience in Washington: Whatever the deal struck between North Korea and the US, Washington has nothing to lose. Moon said Kim is working toward an “irreversible denuclearization process” by shutting down its only known nuclear test site in Punggye-ri. Moon also cited Kim’s pledge to allow in outside inspectors to monitor the dismantling process of a missile engine test site and launch pad in Tongchang-ri. However, what the US would do in return involves less risk than what North Korea has done so far, Moon said, because measures that can be taken by Washington are largely reversible, depending upon how North Korea responds. The same is true for the South Korea-US decision to suspend their annual joint military exercises, Moon added. The allies had conducted massive computerized war games almost twice a year until they were suspended in light of the PyeongChang Winter Olympics in February. Since Moon promoted the idea of declaring an end to the Korean War after his first meeting with Kim in April, concerns have been growing in Washington that it would lead to the eventual withdrawal of US troops stationed in South Korea. Moon has asserted there will be no US troop withdrawal even after the declaration is signed ending the Korean War. Moon said the idea was echoed by Kim — a dramatic shift in stance as his predecessors had called for the withdrawal or a reduction of US troops from the Korean Peninsula. During his trip to the US, Moon pushed his point further. Not only will the US troops remain after declaring an end to the Korean War, it will also maintain its presence after the two Koreas are reunited. “Even after a peace treaty is signed and the two Koreas are reunited, I think it is necessary for the US forces in South Korea to remain for the sake of stability and peace in Northeast Asia,” Moon told Fox News. Since the Korean War ended in a truce, about 28,500 US troops here have played a significant role in deterring aggression from the North. Analysts expect Washington will expand the troops’ role in consideration of the increasing rivalry with China in Northeast Asia.